In my world photography and adventure should go together. While most people would probably think being the photographer is a more exciting experience than being a viewer, I like to think they can be equal undertakings. So once again, I hit the road to experience photography as a spectator. 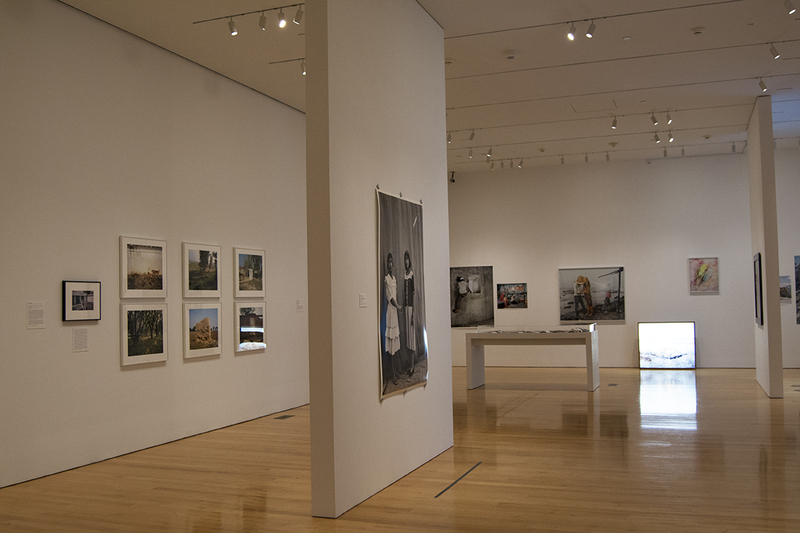 I traveled to Philadelphia, Pennsylvania to see Picture This: Contemporary Photography and India, on view at the Philadelphia Art Museum from December 6, 2015 to April 3, 2016. I flew from Dallas and arrived in Philadelphia at 12:30am. I found a cozy spot on the airport floor to sleep. Between 5am and 6:30am I slept off and on as barista’s arrived to begin brewing coffee and passengers and other airport employee’s began to stir about. Once I got up, I got ready in the airport bathroom, had breakfast, watched the news, and then took the train into the city. Picture This is being held in a building across the street from the main Museum building. As I entered the secondary building my anticipation grew. I had not been this excited for an art show since I saw a piece by Fred Wilson years ago at the Glass Museum in Tacoma, Washington. This exhibition is being held in a small gallery and is an intimate show of photographs by Gauri Gill, Sunil Gupta, Max Pinckers and Pamela Singh. My excitement for this show primarily stemmed from the fact that I was finally going to get to see Gauri Gill’s work in person (I wrote my MA Art History thesis on a body of her work). Once inside the gallery I was like a kid in a candy store. I did not know where to look first. I could not focus, but I tried to be methodical. Once I took it all in as an overview, I started with Gill’s work,quickly moved to Gupta, then to Pinckers, and finally tried to focus on Singh. However, it did not work. I continued to ping-pong around the gallery for at least half an hour. I took some photographs of the work and decided to take a break and look at some other exhibitions. Once I was back in Picture This, I decided to make some notes to help slow down the looking process and to give my brain some space to think. Once again I started with the work of Gauri Gill. Hers is the work I am most familiar, however, the work I wrote my thesis on is not a part of the show. Her work in this show is from her project Balika Mela. There were 13 photographs from this project on display. Five of the images were large black and white prints, while the other 8 were small color photographs printed on glass. Gill photographed the Balika Mela photographs at a girls fair in Lunkaransar, Rajasthan, with girls from seventy surrounding villages in attendance (gaurigill.com/work.html, accessed 4/5/2016). Gill was first invited to make photographs at the fair in 2003, during which time she made the black and white photographs. In 2010, she returned to the mela and created the color photographs. The girls would decide what they would wear and what props if any were in the photographs with them, in this way each photograph is a collaboration between the sitters and the photographer. The photographs printed on glass (see below) take these studio portraits to a new level. Using backdrops and props in Indian portraiture is a long held tradition and as Christopher Pinney has suggested takes the sitter to a new space, the space where they project themselves as they would like to be seen. Having the photographs printed on glass gives them a luminous quality. There is a newness to the photographs a smooth reflective tactile sensation, a sense of a different future. The glass in a way represents industry and modernization, the complete opposite situation from what these girls experience in their daily lives. Sunil Gupta’s work is quite personal. He is Indian born but his family moved to Canada when he was a teenager. Now he spends his time between New Delhi, New York, and London exploring “the politics and experience of gay life, often in terms of his own identity as an HIV-positive Indian man” (Philadelphia Museum of Art pamphlet for Picture This: Contemporary Photograph and India, 2015). The exhibition included 13 photographs by Gupta, 2 from his series Christopher Street, 1976, 7 from Country: Portrait of an Indian Village, 1 from Here to Eternity which is a diptych titled Chicago/Hoist, and 3 photographs from Towards and India Gay Image. I was most struck by one of the photographs from Towards and Indian Gay Image titled Lake, Udaipur (see below). For one thing I was not familiar with these photographs, however, they are visually similar to his project Exiles. Second, I have been to Udiapur and recognize where the photograph was take, so that kind of connection will always draw my attention. Lake, Udaipur shows two men with their backs to the camera. One is dressed in dark colors while the other is wearing white. The two men stand at the edge of a ghat looking out over the lake. They seem to be talking. It also appears as if they have thrown things into the lake as in several spots ripples radiate out in circular form. In the background beyond the lake an Aravalli Hill rises from the earth. There is an emptiness, loneliness of being separate from the world and one another even though the men are standing next to each other. Max Pinckers work has been getting a lot of attention, especially his project Will They Sing Like Raindrops or Leave Me Thirsty. I saw some images from this body of work at Chobi Mela VIII last year. Another version of the work was installed for this exhibition. In totally there were 13 photographs from Will They Sing Like Raindrops or Leave Me Thirsty. Nine of the images were prints hanging from the wall, 3 prints were framed, and one image was printed on transparency and back-lit. The light box image (see below) is an appropriate image to illuminate. While the light box photograph is illuminated from behind all of his work has a luminous quality because of his use of color and the way he prints them. It is of a fire at the edge of a river. There is a mound of dirt in the middle foreground, embers burning beneath the dirt, while one log burnt log lays on top. The sandy bank surrounds the burning mass. On the other side of the river there are people and some animals, bulls or buffalo, however, they are two far in the distance to tell. Life goes on on one side of the river while I can presume death and/or destruction is taking place right in front of us. This photograph is ominous in comparison with many of the other images. Something is coming to an end. According to Pinckers artist statement this project is about “specific aspects of love and marriage” in India (http://www.maxpinckers.be/projects/will-they-sing-like-raindrops-or-leave-me-thirsty/, accessed 4/5/2016). That being said I automatically think this photograph is about the death of a person, a love coming to an end. Max Pinckers, from Will They Sing Like Raindrops or Leave Me Thirsty, 2014. Pamela Singh is the last photographer in the exhibition. I was not familiar with her work before I saw this show, but now I am interested in exploring her work further. Picture This contained 10 photographs by Singh, 2 large (approx. 14 inches x 14 inches) square photographs both of which were hand painted and framed from the series Tantric Self-Portraits, the remaining 8 photographs are roughly 8 inches x 10 inches from the series Treasure Maps. Furthermore, 3 of the photographs from Treasure Maps were partially hand painted. Jaipur # 18 from Tantric Self-Portraits caught my eye because of the incredible hand painting. Specifically the writing along the edge of the stairs (see below). Jaipur # 18 is a photograph of the sundial in Jaipur. The sundial was built in the 18th century and is the largest in the world. Singh photographed the sundial so that it created a slightly off center symmetry. As your eye wonders up the pink staircase you first notice the golden Hindi writing along the edge. Three-fourths of the way up the stairs are two dogs each facing a different way. Beyond the dogs Singh stands in a black dress, her head and shoulders are cropped out of the frame by the edge of the photograph. At the bottom of the stairs there are drawn images on either side. On the left side there is a yellow line drawing of a figure creating a human mandala. On the right side there is a circle divided into slices with each piece containing a symbol. The symbols include a sitar, snake, ship, arrow, star, a gray triangle (I am not sure what it represents) and a tree. Beyond the sundial there is a building painted pink. The electric lines hold painted birds. Behind the pink building is a tower with a peacock painted on its apex. On the right side of the photograph there is a tree with a variety of birds painted in it. Through the actual elements and the painted items in the photograph, it embodies the idea of Tantricism, where one is enlightened to “the realization of the essential oneness of one’s self and of the visible world with Shiva-Shakti, the Godhead” (www.dictionary.com/browse/tantra, accessed 4/6/2016). 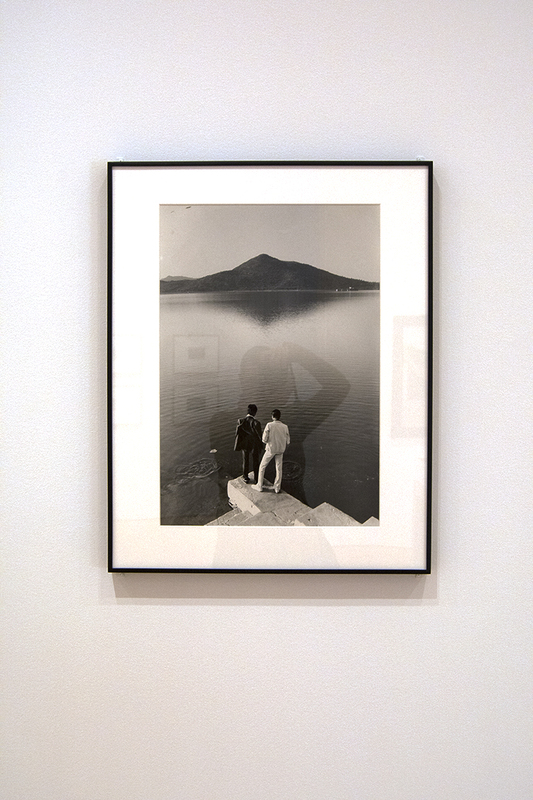 While this photograph is a self-portrait, since Singh’s head is left out of the photograph, the viewer can put them-self into the moment. The question I have left you with is, what thematically brings this work together to create a cohesive exhibition. Each of these artists have incorporated some aspect of performance into the work. In Gill’s work the performance comes from the girls in the photograph, there stances and their interactions with each other and the props. Gupta’s use of performance is a little less obvious. At times it is questionable whether the human subjects know they are being photographed (which comes through in Lake, Udaipur), but I believe they are. Pinckers’ work has an air of spontaneity, however, there is obviously an interaction between the Pinckers and the subjects. The performative aspect of Singh’s photographs come through the fact they are self-portraits and through the hand painted elements within the photographs. In the end, I could not focus on one artist, one project, or one photograph. I was so intrigued with the work that I was like a child with Attention Deficit Hyper Active Disorder, bouncing through the room. The historical context of Gill’s work, the colors of Pinckers photographs, the personal background of Gupta’s images, and the sheer technical skill in Singh’s work creates an exhibition worth viewing. 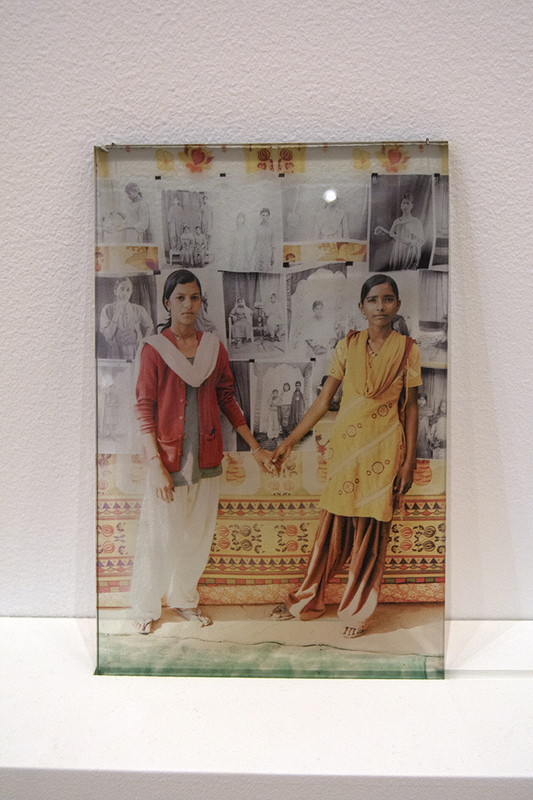 Curator Nathaniel M. Stein brought a visually diverse group of arts together to show there are many ways performance can be used in photograph, as well as, the variety of work emerging from India. I love photography and I love India. I love both a little more now. 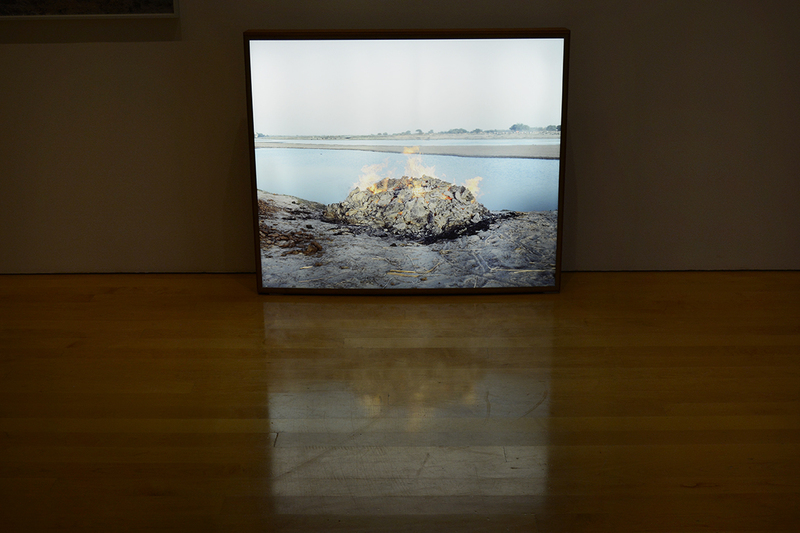 Me (Betsy) in front of the background at Picture This: Contemporary Photography and India. Art, it should be fun, not stuffy!